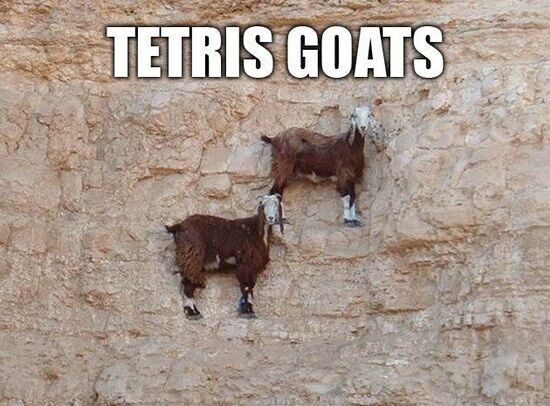 If you've ever played Tetris and thought to yourself that you wish it was a bit more goaty, then there's something seriously wrong with you. But fear not, because you have kindred spirits in Marca Blanca, who have released a video that combines goats and the puzzle game: Tetris Goats. They said it could never be done, but Marca Blanca didn't listen and have replaced the iconic blocks with everyone's favorite devil-incarnate-as-animal, accompanied by an ever-changing chorus of goats bleating out the Tetris theme. Tetris was originally designed by Alexey Pajitnov back in Soviet Russia in the 1980s, before being exported to the US and gaining its now legendary status thanks to the Game Boy version. We've waited a long time, now the goat version has finally arrived.